17. How to select samples within VI? Tutorial VSL explains the using of all the VSL-Products. Tutorial VSL produces Basic Presets with VI. 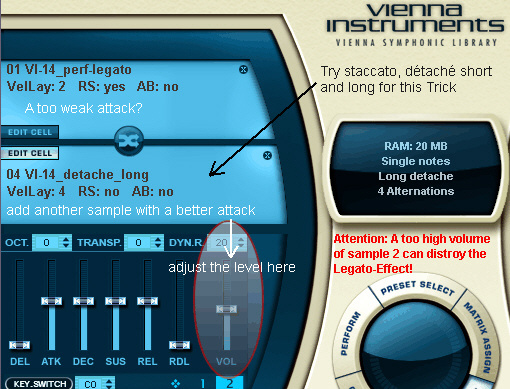 Tutorial VSL makes a mixdown with the following piece. It only uses Suite Effects. Each step is explained. Tutorial VSL also can be used to inform you about a product which you don't own. 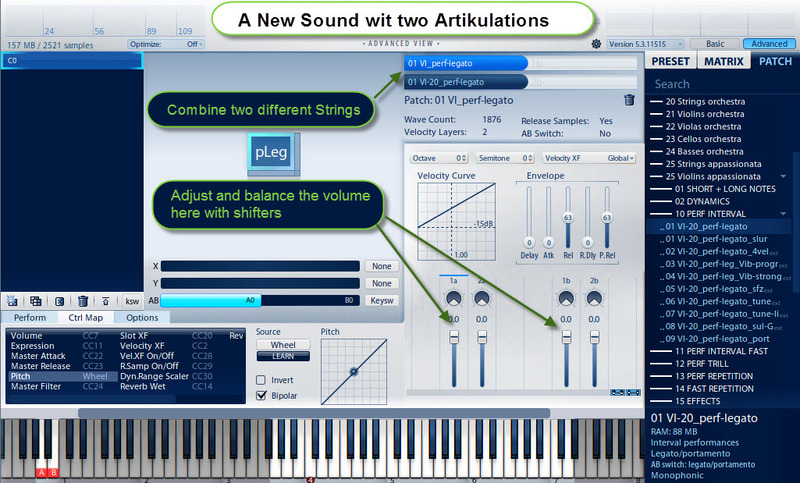 Tutorial VSL is also giving tips for "how to arrange a piece of music" to get a good mix. Combine the sample with another one which has a better attack part. Legato with Portato short or long... But attention here: You could destroy the nice Legato-Sound. So use the second Sample only with a low volume level. Tip: This is an effect more ore less. If you can make out it you use it too intense. A tempo of 60 BPM means that you will have every second a hit. So if you have a 4/4 bar with this tempo it takes 4 seconds for playing it. A tempo of 180 BPM means that you are 3 times faster than the upper example. 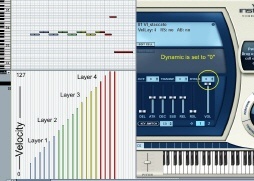 VSL prepared fast repetition samples for the case of tempos above 150 BPM. Think about the bad gun effect we will get by repeting always one or two samples up to 9 times with this speed..
"Fast Repetitions" means a row of nine 16th notes which are recorded in different tempos. If you want to play only four 16th you have to stop the length of the midi signal after a quarter note at the certain tempo. 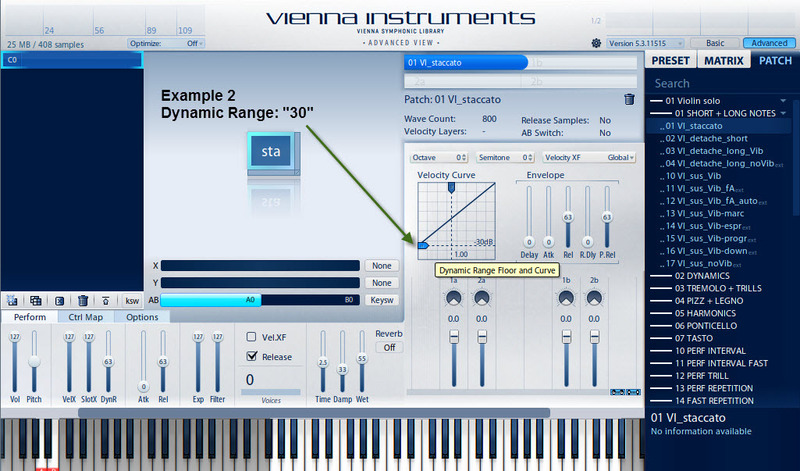 But...The Vienna Instrument offers a function which closes every bundle of repetitions with a proper final note. Therefore make sure that the function (PLAY RELEASE) is "on" (VI-Perform Menu). 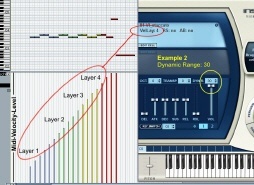 You know that the volume of a midi sound increase the higher the amount of velocity is. The same effect happens with the sample sounds of the vienna instrument. 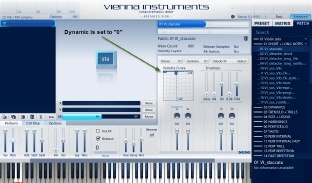 The vienna instrument uses different sample types which correspond to different sound levels of a certain instrument. When the midi level increases the volume of the samples inreases as well. In case of a 2-layer library the sound changes at velocity 89 to a second and more forte sounding sample. 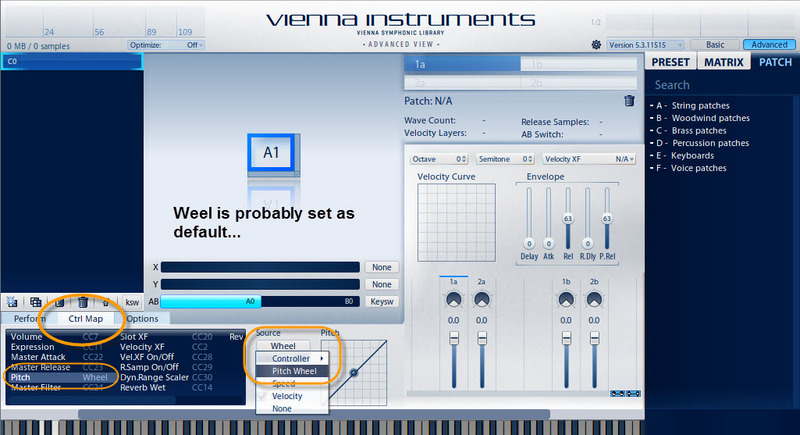 You can adjust how strong the vienna instrument shall follow the midi velocity level. Switch to "Patch Assign" On the left side of the "centre selecting ring" you will find " * 1 2 "
Now you can change the value at "DYN.R." (Dynamic Range). 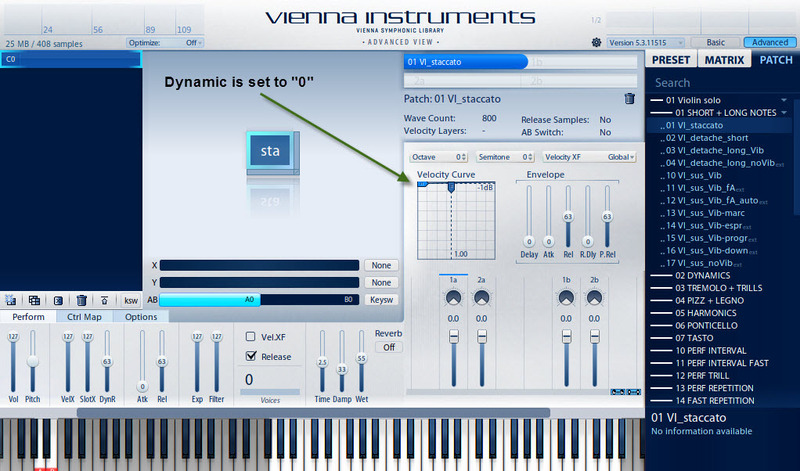 0 = "no velocity following"
Even if the midi velocity increases: The sample volume is quit the same. But the piano sample typ sounds in ff - unnatural! To switch between different sounds with different samples makes sense now. The Dim- and Cresc- articulations often come with a DYN.R. between 8 ... 12. This doesn't make us able to play a really piano diminuendo for example. Increase the Dynamic Range to 15 ... 25 as a starting point for the dims and crescs. 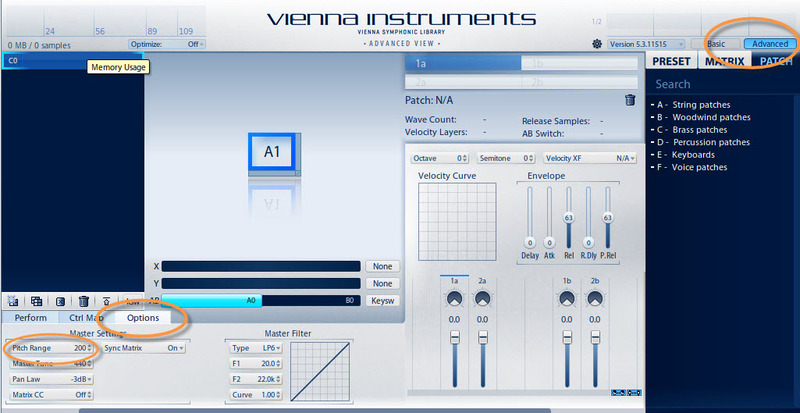 The Vienna Instrument is a Sample Player which can hold lots of articulations of the Vienna Symphonic Libraries. It makes sense to do this for one single instrument like the C Trumpet or the orchestra cellos for example. Further: It makes sense to use each of the possible 12 Matrixes for an "articulation family". Load legato articulations into Matrix 3 (D0)... etc. 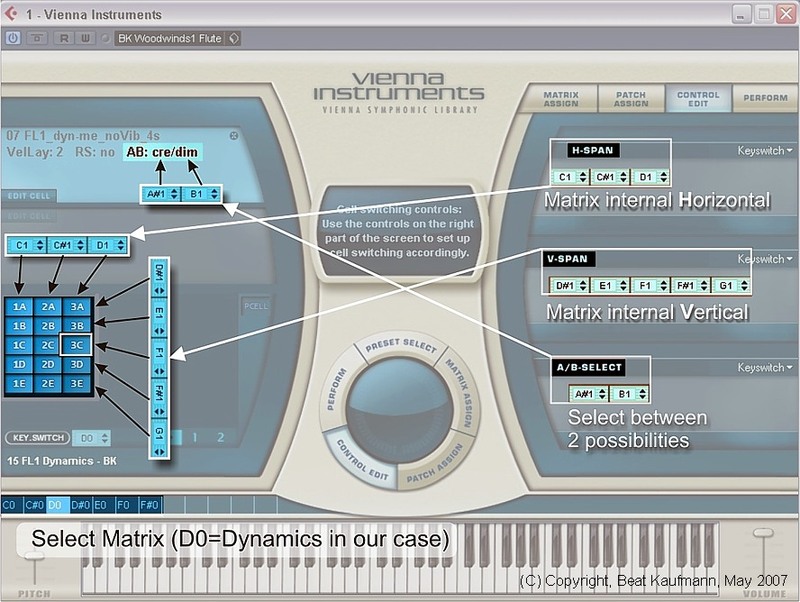 This means: You need 4 VIs for a string quartet - for each instrument one VI. Each of these VIs is in its own track of your host program. Important to know: The VI is not able to understand any midi channel - it ignores midi channel information but not midi controller information. These controllers can be used to switch and control possibilities of the VI, such as X-Fade, Pitch Controll, Volume Control etc. The Vienna Ensemble is a host, so to say. So it is able to host up to 16 single Vienna Instruments. At the same time it only uses one track/ one open VSTi space. 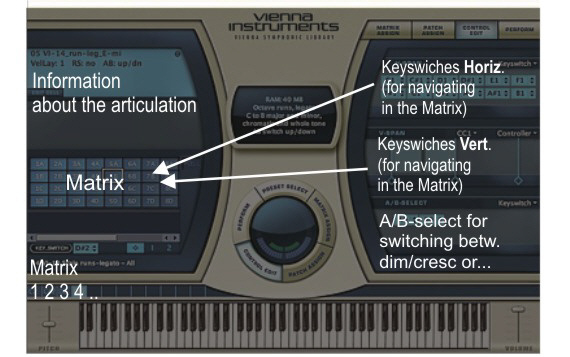 Each integrated VI will be controlled and played by/with an assigned Midi Channel. Prepare a VE with a VI for each Woodwind-Instrument, and a VE with a VI for each String-Instrument... and save these ensembles as Woodwind-Ensemble and String-Ensemble with all the necessary positioning effects etc. 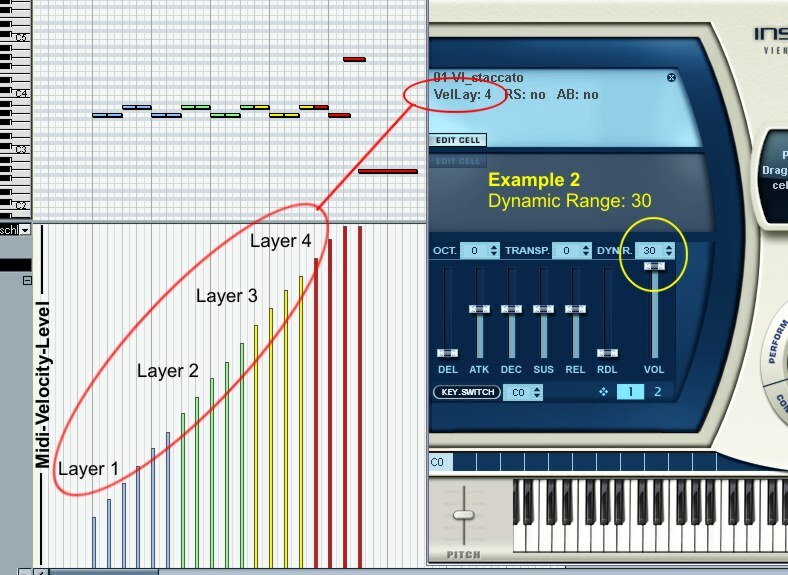 By the way: You can do this «Creating of Ensembles» in Cubase, Logic... as well! But you will need more than on track. 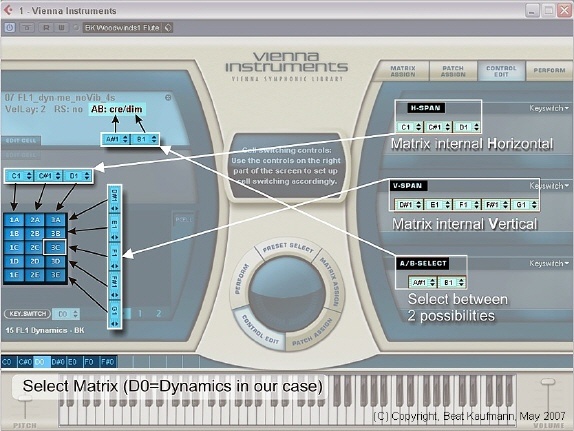 If you are new and not so familiar with VSL, ignore the Vienna Ensemble for the moment and get some exeperiences with the Vienna Instrument first. The VE can be usefull later on. 18. How to build DIVISI... to double Instruments? 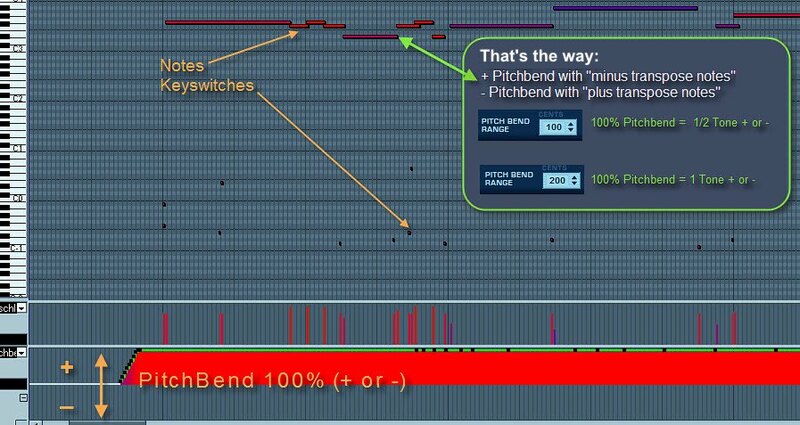 We are going to use the function Pitchbend. 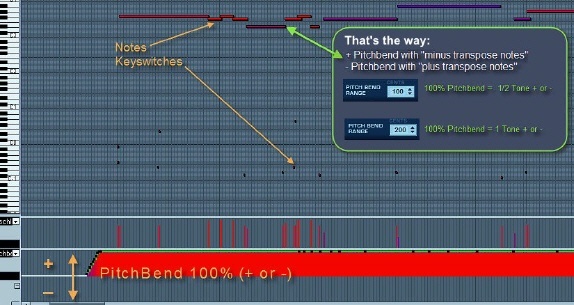 The Trick: We transpose the Midi Notes for a half tone up and "pitchbend" for a half tone down. The Result: We get the same melody but played with other samples. We have the original section, one same section up and one section down = 3 times an equal section for unisono parts. * Sounds more natural but doesn't work with Download- and SE-Libraries. 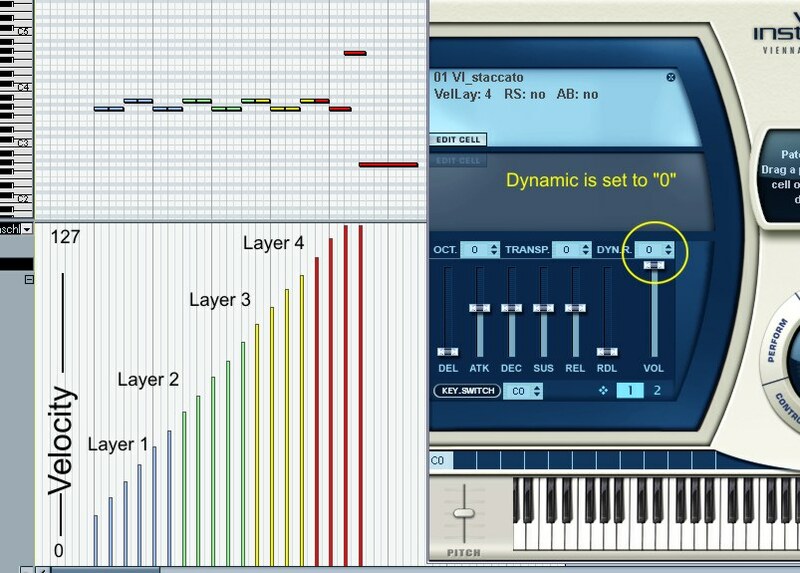 For the SE - Libraries you need to use a midi-transpose of +/- 2 (whole note) and also a pitchbend of a whole tone. 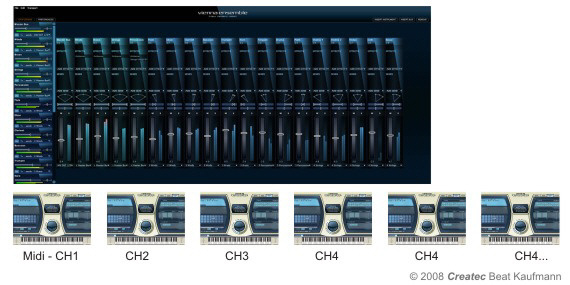 The SE Libraries got samples which are recorded in steps of whole tones. How to arrange the VI? Preparing the VI a)	 Preparing the VI b)	 Our example got 5 Miditracks which are playing a melody "unisono"
And here another picture out from the Sequencer. 1. Try to find the most efficient balance between the sections. 2. Pan the different sections a little different. 3. Give each section a bit another EQ-setting. This method can create new timbres. The 1st Appassionata Violins got the Soloviolin as additional articulations. The nice vibrato of them shine through the compact sound of the Appassionatas from time to time (sounds very nice). Load a second articulation into the B-Cell and adjust its volume as you like it. Not long ago I bought an external Hard Disk. bought it, connected it and worked with it. A bit later I wanted to know how fast my new Ext HDD is - compared with the old one. I installed a disk benchmark software for checking and comparing the power. Then I began to test the new HDD with the different possibilities. We probably need ext HDDs for saving Sample Libraries. So READING is a very important feature. 1. The handling of internal USB-Lines (within the Mainboard) seems to be the fastest possibility. With the removing of the USB-Mouse and the Licence-Keys I got even better results. all the "speed-is-not-important-USB-connections" I moved to the USB-Extension-Cards. I recommend: Test your system as well for finding the fastest USB-connections! A simple check could be to messure the benchmark of a USB-HDD with the different sockets of the computer. - Use the slower ones for the mouse, the keyboard, the licence keys etc. and - above all - for each USB 1.1 - application. - Use the "fast sockets" for all audio - applications. Please keep in mind that the first tips and tricks are more than 15 years old. The GUIs of effects and instruments are therefore no longer up-to-date, but sometimes the content is still. Therefore, the tips and tricks continue to stand. Bitte bedenken Sie, dass die ersten Tipps und Tricks unterdessen mehr als 15 Jahre alt sind. Die GUIs von Effekten und Instrumenten sind deshalb nicht mehr aktuell, der Inhalt aber manchmal schon noch. Deshalb bleiben die Tipps und Tricks weiterhin stehen.